Removes dyes and stains, and whitens fabric. 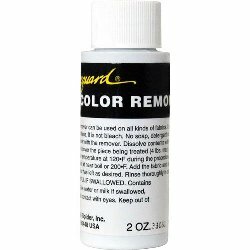 Color Remover can also be used for discharge techniques for surface decoration on fabrics. This powder colour remover may be used on any natural fabric, rayons and some nylons - it will not work on polyester. It requires a high temperature so may bre problematic for wool. It is NOT bleach-based. In an enamel or stainless steel pot dissolve Color Remover in enough hot water to cover your fabric. Use 3-5% by dry weight of fabric. Heat to 185ºF/85ºC, add fabric and continue heating. Color Remover works best at a rolling boil. Keep fabric moving for 10 to 20 minutes or until colour has left as desired. Wash with mild detergent in cool water. Note: When removing colour from fabric, remember all dyes behave differently and results may vary - always test first.